In his forward to The Invent To Learn Guide to 3D Printing in the Classroom: Recipes for Success, Gary Stager makes the case for this technology du jour to have a place in K-12 classrooms. 3D printers are hot. They’re so hot that even schools are buying them. Although, schools are thought to be late adopters of emerging technology, I’ve been pleasantly surprised by how many schools already own 3D printers. Investing in a school’s first 3D printer may be a down payment on the future of education. A future in which learning to learn with one’s head, heart, and hands will be equally critical. Making things is a great way to learn and an ability to make the things you need is an important 21st-century skill. The confidence and competence required to solve problems that the school curriculum or your teachers never anticipated will be the mark of a life well lived. For decades, computer-aided design/computer-aided manufacturing (CAD/CAM) software was too complicated and expensive for more than a few students to use at one time. It was relegated to drafting classes and vocational settings. Now affordable and accessible software like Tinkercad make design child’s play. The ease of use associated with this new generation of software does not mean that the design process has become any less rigorous. Design is where the mathematical reasoning, artistic sensibility, and engineering processes come to the forefront. We were all taught about the X- and Y-axes in our math classes. Some of us may even use that coordinate system from time to time. However, with the exception of the occasional SAT question about the volume of a cylinder, you might conclude that we live in a 2D world. 3D printing and its design software bring us the Z-axis and provide an authentic context for using and understanding 3D space. This book makes the conscious pedagogical decision to transition from 2D design to 3D artifact. A common trope in educational discussions is, “Technology changes constantly.” If only that were true. If your school has spent two decades teaching kids to make PowerPoint presentations on subjects they don’t care about for an audience that doesn’t exist, then “technology” hasn’t changed much for you or your students since Alf went off the air. In rare instances, there are revolutionary advances in technology that impact classroom practice. The technologies most closely associated with the maker movement, including 3D printers and laser cutters, open-source microcontrollers like Arduino, and new ways to embed circuitry in everyday objects, may indeed represent a paradigm shift in educational technology. It IS Rocket Science for Students in Huntington Beach, Calif.
Top: Students print out parts to make another 3D printer. Bottom: These girls made a lightbulb from scratch. Kevin Crossett considers himself lucky. As a CAD/engineering and AP computer science teacher at Huntington Beach High School in California, he and his students get to build rockets and create design solutions that benefit society. From the first Google grant he received for programming training to the Orange County Department of Education grants he used to learn how to build a 3D printer, Crossett has been at the forefront of the Maker Movement. “I got my first 3D printer in 2005, but now that they are open source, we can build our own,” he says. This year, his 11th- and 12th-grade students will build an underwater robot that will have a Ph sensor and a Geiger counter. They will use the robot to gather data to post on a Web site to track radiation in the water at the beaches in southern California from the 2011 nuclear disaster in Japan. The Ph sensor is the first phase in developing a solution to make a better Ph sensor, as outlined in the Ocean Health XPRIZE (oceanhealth.xprize.org) competition. “This project emphasizes science concepts such as buoyancy and water density to control the raising and lowering of the robot in the water. [It] also involves a math formula to determine the constraints we need to work with when adding our own systems to the ROV,” says Crossett. In October, students will launch the rocket they’ve been working on for the Student Payload and Rocketry Challenge (aiaaocrocketry.org/?page_id=915). Next up, they’ll be building their own cube satellite. Educators have good questions about 3D printing in the classroom. It’s not enough to say that a technology is “new” and “cool” (even though it is). Here are some commonly asked questions, concerns, and opportunities regarding 3D printing in schools. 3D printers used to be very expensive, but the prices are dropping every year. The printer we use costs about $1,500, but there are other good looking ones in the $700 price range. The real question is what opportunity is lost if we don’t get tools like 3D printers in front of our students? The print nozzles for 3D printers get very hot—about 260 Celsius to be exact. This is why there are usually shrouds surrounding this part of the printers so fingers can’t get in the way! The heated plate on some printers is as hot as the boiling point of water, so you want to be sure you are wearing gloves if you need to touch it. Of course, anyone who has used a glue gun or an oven knows that there are hot parts that we need to avoid touching. Both glue guns and 3D printers emit a small amount of fumes from the melted plastic. We haven’t seen that this poses any health concerns, so if you use your printer in a well-ventilated place, fumes are not a problem. Unlike paper printers that eject pages automatically, 3D parts typically have to be removed from the printing surface by hand. This takes some care, and students need to be shown how to handle the separation tool. Students also need to wear good leather gloves when working with sharp tools to avoid accidental cuts. Even so, it never hurts to have a few adhesive bandages available for minor cuts. The general rule is, 10 fingers in, 10 fingers out, and safety standards have to be established by the teacher. While the design part of 3D printing takes classroom time, the actual printing can be done in the background, and, if needed, overnight. When used effectively, 3D printing can be connected to many curricular areas and provide one more way to engage students with their learning. While this is technically true, that will not be a problem for printers used in the classroom under your supervision. Second, the gun designs we’ve seen are as likely to blow up in someone’s hand as they are to shoot a bullet. We honestly don’t see this as a concern. Thingiverse and Youmagine are wonderful sites with lots of cool things to download and print. But the real value comes from moving beyond these sites to designing your own parts. David’s father always said that firewood warms you twice—once when you cut it and again when you burn it. A similar idea holds true for 3D designs. This book suggests the design process itself is just as important as working with whatever has been made. One of the great things about the Maker Movement is that everyone wants to share their designs with everyone else. They also love to get comments and learn about variations from those who try them. When you check on any design you want to download, you will usually find a Creative Commons license for attribution or gentle restrictions, such as a Non-commercial or Share Alike license. (You can use, tweak, and share these designs as long as you credit the creator). When your students build their own creations, they may want to make them available to others under Creative Commons licensing. (See Creative Commons for more information about licensing www.creativecommons.org). Should Young Children Use 3D Printers? Engineering is part of the Next Generation Science Standards for K–12 students. 3D printing helps students develop the kinds of skills that develop good design practices that are essential for skills like engineering. Kids of all ages love seeing something they have made, no matter how simple it is. Finished projects can be taken home and are likely to be treasured for a long time. We have a generation of children brought up in a virtual world where objects are shown as displays on screens, not in tangible form. 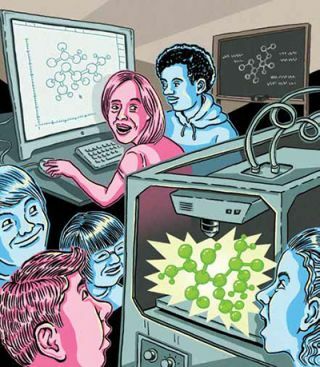 Many years ago, MIT’s Nicholas Negroponte said, “Bits are the new atoms.” With the rise of 3D printing in schools, we can now say that atoms are the new bits! 3D printers can be used for many things, including the construction of math manipulatives of your own design. Physical objects that students make in school are likely to become treasured possessions for years to come. Years ago, when Norma’s daughter, Luciana, attended Kendall College majoring in culinary arts, she built a small piano completely out of chocolate. Even though this artifact was made many years ago, it still is on display at home (and is holding up pretty well!). Another area of engineering exploration for kids is robotics. In the process of designing a robotic model, students may need gears and other specialized parts they can design and make on a 3D printer. This is a completely different approach to robotic structures than those based on Lego blocks. Finished robots that students make can even be taken home when the project is over. Above: Students building a speaker out of laser-cut and 3D-printed components. Below: A student and teacher work on an electro-mechanical music machine. This year, Michael Kenney’s 8th-grade physical science students will learn about electricity by designing their own circuit boards. They’ll use die cutters to make circuits— complete with LED lights, wires, and various types of switches. Kenney says they won’t be using 3D printers for this particular unit, even though his class has two large, self-contained 3D printers and a dozen small Japanese 3D printers that he funded through grants from the nearby University of Virginia. Last year, Kenney’s students built speakers. The bases were 3D printed and students designed cones for the speakers. “They made big ones, little ones, whatever they wanted,” says Kenney. “Then they made a solenoid to make the electricity go back and forth and attached it to the cone.” Students plugged their speakers into their iPods and listened to music, observing the differences due to cone size. Charlottesville (VA) City Schools has been a forward-thinking district for a long time, says Gertrude Ivory, associate superintendent for curriculum and instruction. “We’ve had SMART boards for more than 10 years, ‘saturated carts’ with emerging technology for teachers to try out, and a three-year-old 1:1 tablet initiative for grades 6–12.” In addition, the city council is renovating science labs at the middle and high school and making a state-of-the-art STEM lab at the high school. About two-and-a-half years ago, the district worked with the University of Virginia and became the first public school district in the state to establish a laboratory school for advanced manufacturing and STEM -based learning. “We had lots of corporate sponsors who gave us 3D printers, as well as grants from the state and the university,” says Ivory. Top: An instructor reviews student-designed 3D printed golf grips. Bottom: A students modernizes older instructional robots in the MakerSpace. Just over a year ago, a portion of the aging North Hall High School (NHHS) in Gainesville, Ga. was remodeled to include STEM classrooms, a MakerSpace lab, and a dedicated, state-of-the-art, wet-lab facility. The school’s STEM Academy houses a MakerSpace, which is used as a resource by science, math, engineering, and language arts students. The MakerSpace is outfitted with a MakerBot 5th-generation 3D printer, a 3D digitizer/scanner, a CNC mill, a VEX robotics workshop and competition arena, Arduinos, Makey-Makeys, and a wide assortment of miscellaneous electronic and mechanical components and tools. It is a 1:1 laptop environment, providing each student with access to professional Autodesk 2D and 3D design software, including AutoCAD and Inventor, as well the Adobe Design Suite. Wide format printers and plotters are available for students to output technical drawings, renderings, and architectural plans. We are currently awaiting arrival of a second 3D printer, and over the summer we installed a large-scale industrial Haas CNC vertical mill in our metals shop. ■ Biology and engineering students design and 3D print (or mill) instrumentation components for experiments, such as electrophoresis and PCR chambers. ■ Biology students design and 3D print microscope adapters for cell phone cameras. ■ An engineering student designed and prototyped design modifications to a surgical instrument based upon research and real-life observations in an operating room. ■ Engineering students learn collaboration skills by working in design teams to design 3D printed parts that physically connect to parts designed by other teams. ■ Students design and build robotics to emulate cellular processes. ■ Students design and fabricate rocketry components. ■ Students can 3D print cases for student-designed, Arduino-based electronics. ■ 3D printing is very time-consuming. Typical prints often take several hours to produce. This process has proven to be a bottleneck. Many students learn and create best when the product is tangible. The problem-solving and engineering-design process, which is what we’re trying to teach, requires iteration. Multiple iterations times several hours for each student-design team keeps our 3D printer running almost nonstop. While we’ve purchased a second 3D printer, we’ve come to realize that the actual production will always be a bottleneck. Therefore, we’ve brought an increased focus to using 3D modeling, visualization, simulation, and tools like computerized stress analysis prior to 3D printing in order to optimize designs before printing. ■ Today’s STEM students are highly efficient at teaching themselves how to use tools (e.g., hardware and software). As faculty, our job is to provide them safe access and basic training on as many creative platforms as possible. Content-area teachers in the STEM Academy rarely assign specific design projects. Instead, they encourage creative thinking, problem solving, and MakerSpace-enabled ideas. Given a basic introduction to the tools and creative outlets, students learn by creating, and they create to demonstrate their learning. Ley Hathcock is assistant principal of North Hall High School in Gainesville Ga.
T&L sat down with Sylvia Martinez, author of Invent To Learn: Making, Tinkering, and Engineering in the Classroom. Martinez speaks, writes, and advocates for student-centered, project-based learning, gender equity in technology, computer programming, and lifelong learning. She also helps schools incorporate authentic learning in their classrooms. T&L: Can you describe the Maker Movement’s history and how it continues to evolve in the classroom? SM: The Maker Movement is a global revolution in the way people solve problems and share solutions as they gain unprecedented and inexpensive access to devices like 3D printers and microcontrollers. For many educators, this self-directed learning revolution outside of school resonates with the way they know children really learn, yet is not happening inside school. Educators see the Maker Movement as an avenue to re-introduce authentic learning experiences into school and give children agency over their own learning. As more educators find ways to make this happen, collaboration and sharing deepens and provides better on-ramps for other educators to adapt and adopt these techniques into their classrooms. T&L: Why is it so important for schools to encourage students to participate in Maker Movement activities? SM: We can’t expect students to become the global citizens and problem solvers the world needs if we don’t give them opportunities to solve real problems at a young age. The interesting and affordable technologies of the Maker Movement give students a chance not to just learn about science, math, or history, but to be scientists, designers, and inventors right now. T&L: Are there any good online resources for kids whose schools don’t offer Maker Movement classes or camps? ■ Build by Kids (builtbykids.com): Project ideas, tool tutorials, and weekly projects for club members. ■ DIY (DIY.org):Watch online tutorials, upload pictures of creations with a phone app, and collect badges. T&L: Where do you see the Maker Movement heading? SM: I think the Maker Movement can inspire needed changes in school that will engage and energize students. One problem today is that people think that the Maker Movement requires expensive purchases or a special room. However, as more schools create examples of excellence, I believe that people will see that “making” in education is not a shopping list or a special place, but as a stance towards learning that gives kids the tools and can-do attitude to tackle any problem they choose. This is unequivocally good for students, teachers, families, and the whole world. When 8th-grade technology education teacher Jim DeMarino heard from a colleague about the problems her son, Stephen, was having with the homemade PVC pipe-pencil- type gadget he used to operate the communications device on his wheelchair, DeMarino sprung into action. He knew that the students in his classes could design and fabricate an assistive device to help Stephen, who doesn’t have full use of his hands, and improve his daily life. DeMarino’s district, Arlington (VA) Public Schools, has offered technology education classes to middle and high school students for several years. These classes ensure that students understand problems, can access options for brainstorming their ideas, and define and build solutions. With all of these resources, DeMarino was certain his students could come up with a better design for Stephen. As an adopter of the Autodesk Design the Future program (www.autodesk.com/designthefutureus), Swanson Middle School has free access to Fusion 360 (www.autodesk.com/products/fusion-360/overview), the cloud-based 3D design software from Autodesk. The students digitized their drawings and original ideas and discussed the best ones with Stephen’s mother. Next, they fine-tuned their designs with her feedback to ensure they met Stephen’s needs before 3D printing them for him to test. Throughout the process, the students applied textbook engineering and science concepts to solve a real-world problem. Barnes County students are happy to work on their enterprise. When groups of 6th–12th-grade students at Barnes County (ND) North Pubic School began doing a series of activities last spring, they had no idea what was in store for them this fall when they began their grant-funded Living and Breathing Common Core Through School-Wide Enterprise (www.ndetc.k12.nd.us/files/2014/04/Barnes-County-N-for-website.pdf ) project. As students discovered various activities they enjoyed, teachers began identifying their strengths and placing them in teams so they could begin making and selling printing services, perishable goods, and community items. While many of these projects are prescribed, you may wish to use the following Web sites to find ways to open up ideas for thinking outside the box and providing for innovation. ■ Instructables: When first opening the program, give the Search Engine a try. Put in some keywords for possible learning ideas such as planets, insects, civil war, or nutrition. ■ The Exploritorium Tinkering Studio: The Tinkering Studio is primarily an R&D laboratory on the floor of the Exploratorium, but whenever possible they try to share their projects, activities, and developing ideas following an open source model. ■ The Exploritorium Tinkerer Collection: Use this site to introduce your students to some amazing Tinkerers and the occupations that surround them. ■ DIY: Do It Yourself is a platform for students to discover skills and share what they make and do with each other and the global community. ■ How To Smile: This is an amazing collection of some of the best educational materials, learning activities, tools, and services, all designed for those who teach school-aged kids in activity based settings. ■ HowToons: See what happens when a comic book artist, an inventor, and a toy designer work together. ■ Science Toy Maker: Science toy maker is a resource for inspired kids and their teachers to really make something out of it! ■ Global Cardboard Challenge: This is a project from the Imagination Foundation inspired from Caine’s Arcade. It is a great way to inspire kids with cardboard. ■ Maker Camp: Students join other young inventors and artists from around the world on Google+ to make awesome projects, go on epic virtual “field trips,” and meet the world’s coolest makers. 3DKitbash offers 3D printable toys for sale. One example is Quin, the printable doll, who is 10.8” tall, has articulated limbs, multiple hand options, and 3D-printable hairstyles. Brain Coporation’s team of neuroscientists has teamed up with Qualcomm to develop an adaptive intelligence platform that allows anyone to teach a robot a particular task without knowledge of programming or complex algorithms. The robot body is entirely 3D printed, and it takes the shape of a mobile-inverted pendulum that was developed with the UC San Diego Coordinated Robotics lab. 3D Systems Corporation has released several products for education, including the Touch mouse, which is designed for 3D sculpting, the Cube 3D printers for the classroom and home, and Blokify, a game-like 3D environment. The company also offers discounted bundles and free curriculums and resources to schools and independent educational programs. Juniper Research has released a report, titled “Consumer 3D Printing & Scanning: Service Models, Devices, and Opportunities 2014- 2018.” The report states that the combined market value from consumer 3D printer hardware sales and materials is forecasted to exceed $1 billion by 2018, compared to just over $75 million this year. The report also noted that content will be critical to the success of consumer 3D printing. The Edustation STEM Lab is designed to improve math and science skills for middle and high school students through flight simulation. Edustation Flight Simulators are used in the lab to execute the flight plans designed by the students and test the principles and predicted outcomes in accurate flight simulation. Intel has designed a friendly, walking robot named Jimmy that can sing, translate languages, send tweets, and more. Jimmy is a research robot, though a less sophisticated version will be on sale later this year. The blueprints for 3D printing Jimmy will be available for free, but you’ll need to purchase a kit from Intel that contains all of Jimmy’s nonprintable parts, such as the motors and the Intel Edison processor. Leapfrog has launched an education store with two different curriculum options. The primary education curriculum plan, designed for students ages 10–12, has 14 lessons and introduces students and teachers alike to the concepts of 3D printing. The high school curriculum plan, designed for students ages 13–16, will expand on these skills and focus on practical and business applications of 3D printing. The LEGO Education MINDSTORMS EV3 set lets students create and program robots in the classroom, and features curriculum offerings for design engineering, science and space focused lesson plans that align with the Next Generation Science Standards. 3D Systems has partnered with Level Up Village (LUV) to provide students ages 8–12 with STEM curricula and after-school classes. When students take a class in the US, that class is given to a student living on $2 or less per day at a LUV partner school in places such as India, Uganda, and Pakistan. The partnership is part of 3D Systems’ MAKE.DIGITAL education initiative and online hub that offers 3D printing resources, curriculums, product bundles, and classroom training. MarkerBot, a subsidiary of Stratasys Ltd., offers the largest installed base of desktop 3D printers sold to various markets, including education. The MakertBot 3D Ecosystem drives adoption of 3D printing and includes Thingiverse.com, the MakerBot Digitizer Desktop 3D Scanner, and the MakerBot Desktop. Maker’s Empire in Australia has created a 3D printing app for kids. Students will be able to 3D print their own objects through a tablet without the need for CAD programming skills. Maker’s Empire lets users assemble simple shapes to build more complex objects, as well as draw, write, and import more elaborate designs. Microsoft is adding native support for 3D printing through the Windows 8.1 update to enable printing directly from an app to a 3D printer. The company is working with partners such as MakerBot Industries, 3D Systems, Afinia, AutoDesk, and Netfabb. Mirobot is an open source robotics kit that is easy to build and features stepper motors for improved accuracy in motor movements. It is programmable via Wi-Fi, and it allows users to simply connect it with their laptop to get started. Mirobot can be programmed in Scratch and in the standard Arduino programming environment. New Matter has introduced its MOD-t printer and accompanying design marketplace. The device is estimated to ship to consumers in 2015 for under $300. The MOD-t will feature built-in Wi-Fi, print speeds of 80mm per second, and layer resolution selectable from 0.2 to 0.4mm, while printing objects of up to 4” x 6” x 5” out of Polylactic acid plastic and a fused deposition modeling technology. This book offers an easy-to-digest overview of current research on low-cost 3D desktop printing with the aim of inspiring young students and educators to build up their own 3D printing experiences. The book is also available in Spanish, Russian, Korean, and Italian. Mission Street Manufacturing has created a 3D printer designed for elementary school students. It’s easy to use, and it works with an iPad instead of a traditional desktop setup. The Printeer will ship in October 2014. RobotsLab has released RobotsLab BOX, a kit that includes a quadcopter, tablet, robotic arm, a spherical robot, a circular robot, and lesson plans for everything. Teachers can use the tablet to make the robots demonstrate STEM concepts. The software and lessons come preloaded, so there is no need for prior programming or robotics knowledge. 3D printing company SeeMeCNC has launched a complete 3D printing curriculum, SeeMeEducate, which is easy to use for beginners to advanced classes and can be adapted to any size class in any grade. The curriculum includes complete lesson plans and printable objects. The curriculum can also be added to and improved as teachers make adjustments to the plan. Artec Group has released Shapify, a program that lets you scan yourself at home and get a 3D print of your figurine. No training or 3D printer is needed as Shapify works with Microsoft Kinect and a computer. Artec then ships the figurine to your home. Solidoodle has announced Solidoodle U, a comprehensive program that provides schools with all they need to bring 3D printing into the classroom with affordable education packages and free materials to get students started. The Solidoodle 4 package inludes the Solidoodle 4 printer and two 2-lb spools of filament, while the Solidoodle 3 package comes with the company’s open design printers and one 2-lb spool of filament. TAB Electronics, a publishing imprint of McGraw-Hill Education, produces how-to guides for technical hobbyists and students alike. Each book contains learn-by-doing projects, and the range of subjects covers everything from Arduino to steampunk to 3D printing. Tinkercad is an easy-to-use tool for creating digital designs that are ready to be 3D printed into physical objects. Users are guided through the 3D design process through “Lessons,” which teach the basics before moving on to more complex modeling techniques. Tynker is a creative computing platform used by more than 8 million students. Students can use the Tynker app to create animations and games from templates. Beginners use Tynker’s drag-and-drop visual programming blocks to build a feature or function based on the template they are working with. More advanced programmers can create new projects totally from scratch. There is both a free and paid ($4.99) version. VEX Robotics now offers a variety of VEX curriculum offerings, each tailored to the needs of teachers who want to incorporate robotics into their STEM courses. There are currently five offerings, each with unique goals and methods of implementation.